I recently held a technique class and this was one of the cards that we made. 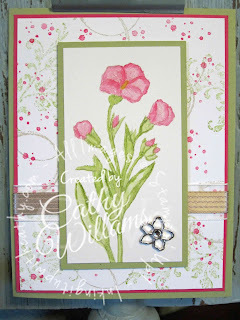 Watch the video below to see how to make this watercolor flower without the appearance of any stampng lines. Here is the inside of the card. 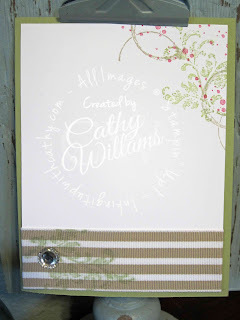 While I stamped off once for the textures using the Melon Mambo and Pear Pizzazz on the card, I used the Pear Pizzazz ink full strength on the Crumb Cake Striped Grosgrain Ribbon. To see and order any of the items used in today's project, just click on the items below to see them in my Online Store. You can order from me if you live anywhere in the United States. I would love to be your Demonstrator if you don't already have one. When setting up your account, please allow "Demonstrator contact" in your preferences so I can thank you properly when you place your order. Note - Stamp sets and bundles noted below may be available in other mount options - wood, clear mount or photopolymer. I have listed the option that I used. Please check my online store if your preference is different.